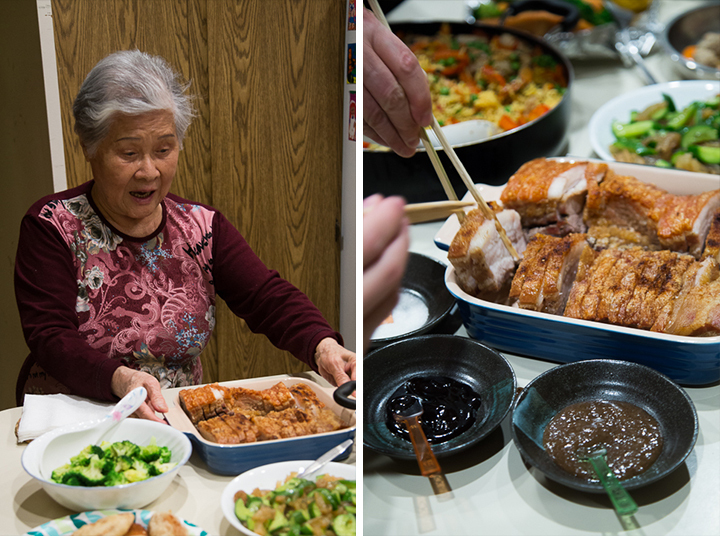 When the Wongs toted that crispy brown whole roasted pig through the Chiu family front door last May for our engagement party, they had no idea that they would be enlightening their future in-laws to a new level of pork. 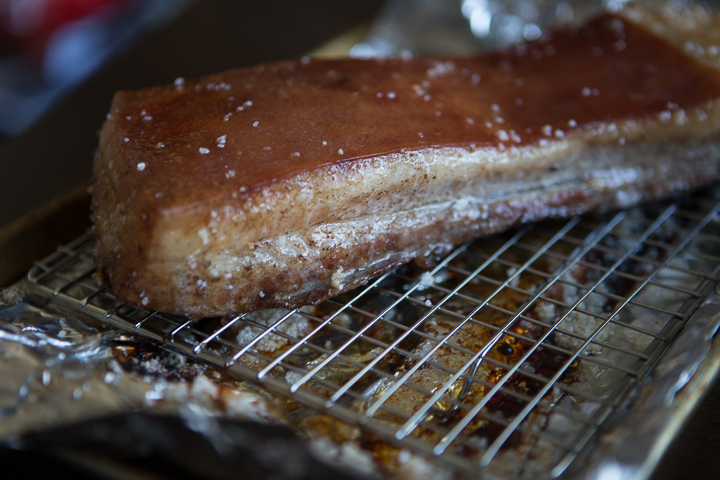 Audibly crackly skin over juicy layers, the fragrance of five spice and white pepper mixed with that thick savory-sweet dipping sauce, bits and pieces of meat flying from the cleaver after each bang to the cutting board--it was definitely an unforgettable affair for the five senses. 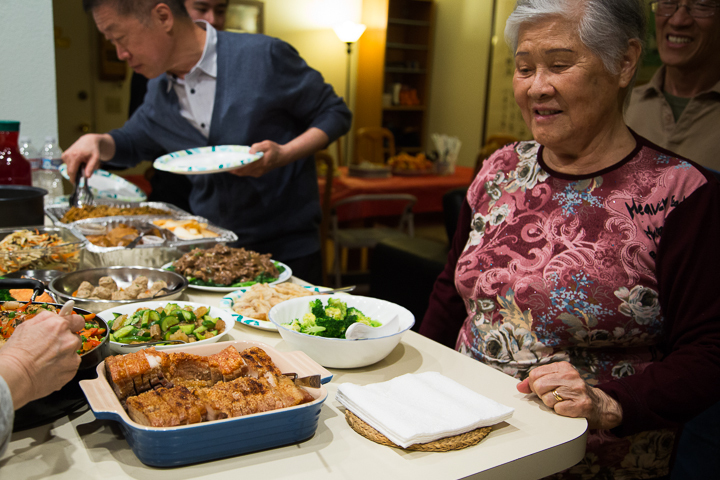 The Chius are accustomed to having pork stir-fried, stewed, or braised. Cantonese style roasted pork (not to mention the whole beast with the head and all four legs intact) was kind of phenomenal. 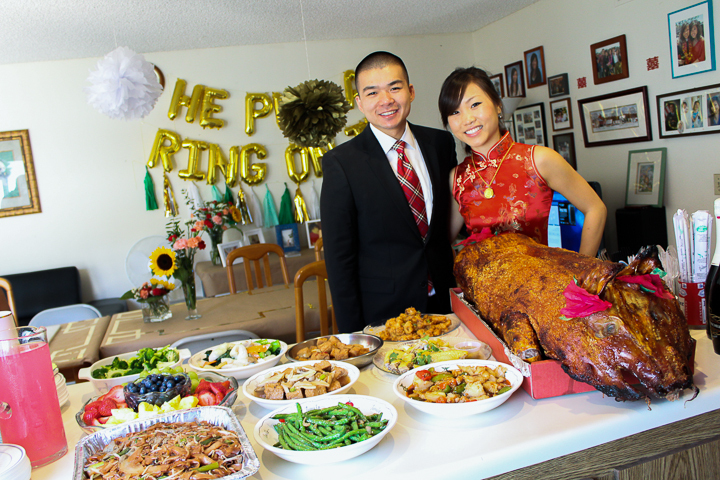 So, for our first Lunar New Year as a married couple, Mama Chiu requested a couple of pounds of roasted pork to go with the other things that she would be preparing for our family feast, just as a treat. 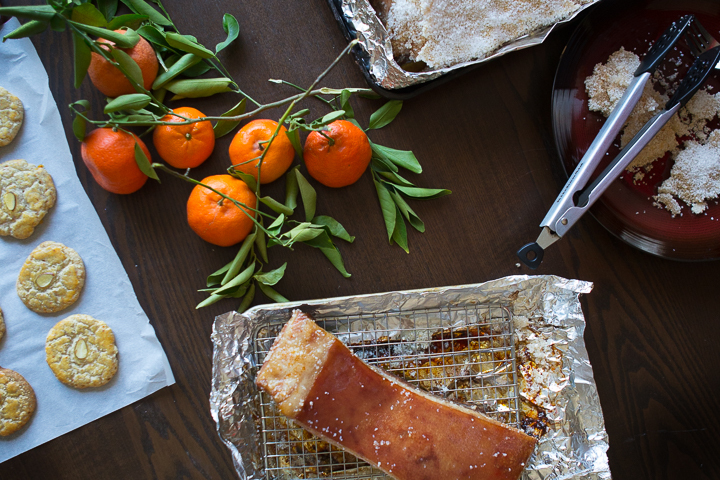 Unfortunately, obtaining roasted pork on the Lunar New Year is somewhat like buying ham from HoneyBaked on Christmas Eve, except with voracious Chinese ladies and no pre-order-for-pick-up option. Plus, all the nice, juicy belly parts would most likely be claimed already. Therefore, to eliminate the hassle, Wes decided to just make it himself (which to me, seemed like an even bigger hassle). To him, it was going to be a fun challenge, as neither of us have ever done it before. He found and followed this recipe and it turned out really well! 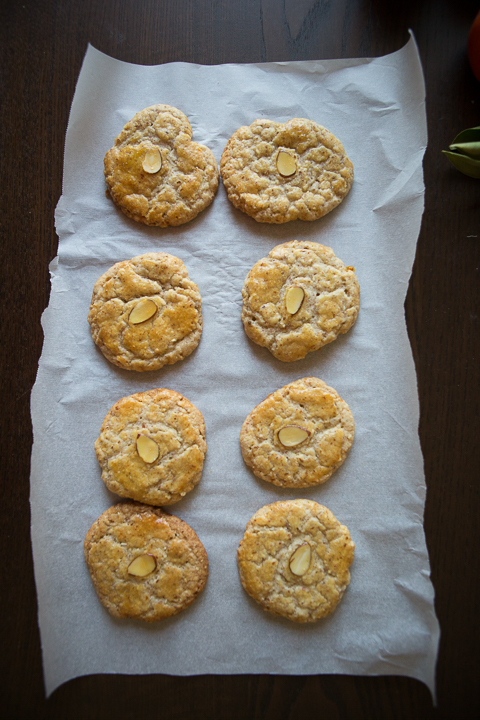 I also made some Chinese almond cookies using this recipe, and those were also a hit - especially with Grandma, who hijacked almost half the batch in one fell swoop. 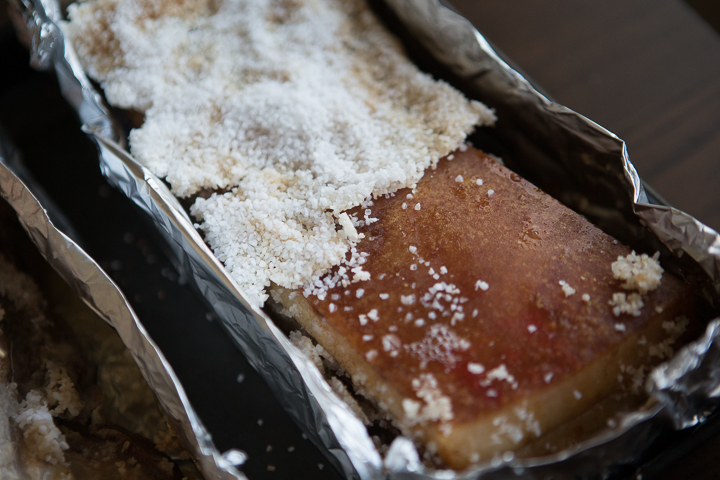 No fancy techniques were used with this traditional dish - just an oven, the typical Chinese spices and aromatics, and coarse sea salt. 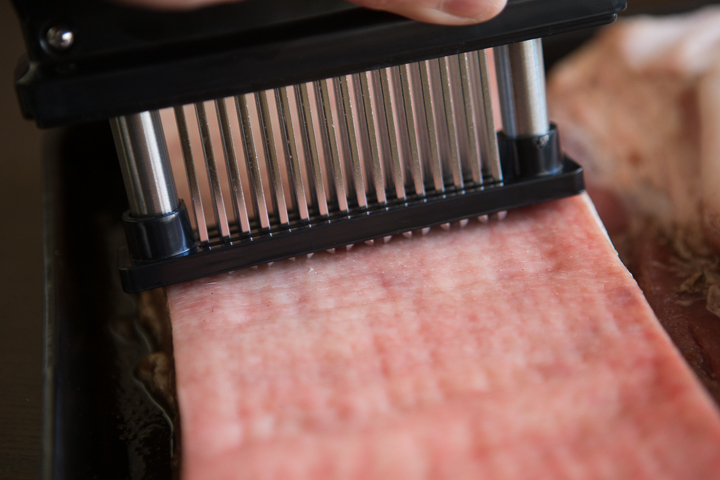 Well, Wes did utilize a meat tenderizer, but it isn't necessary if you would rather poke holes in your meat using some other kitchen apparatus. 1. 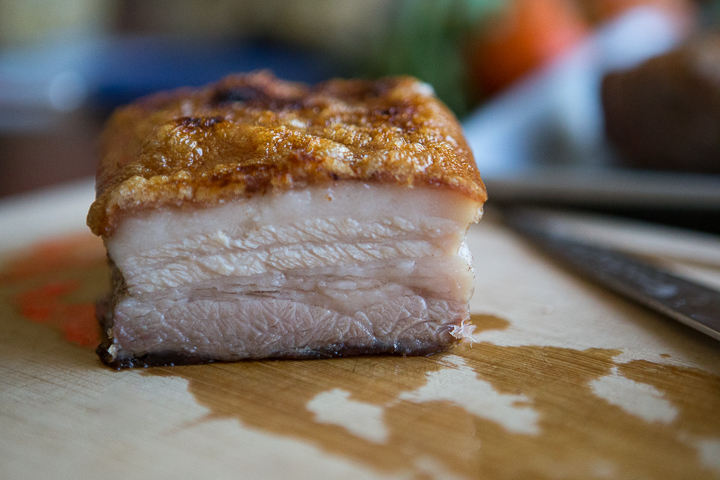 Rinse pork belly and pat dry. 2. 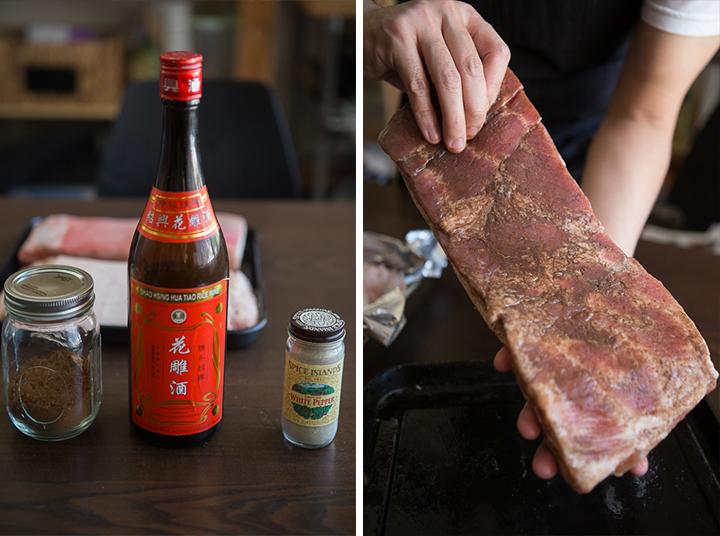 Rub the meat side of the pork belly with Shaoxing wine. 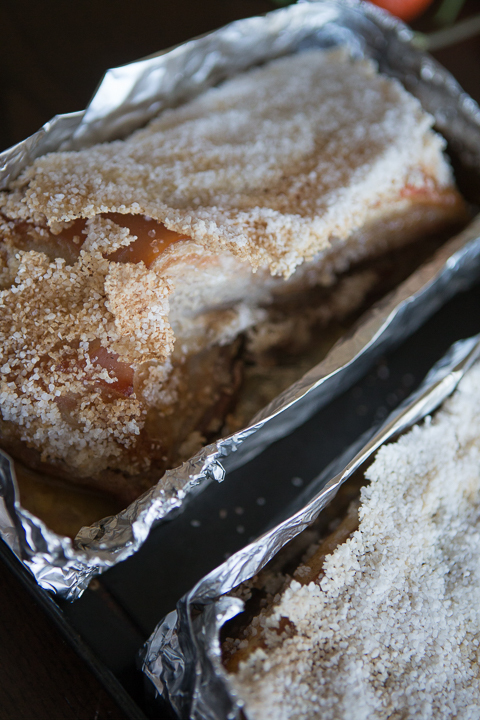 Mix five spice, salt (non-coarse), sugar and white pepper and rub into meat side. 3. 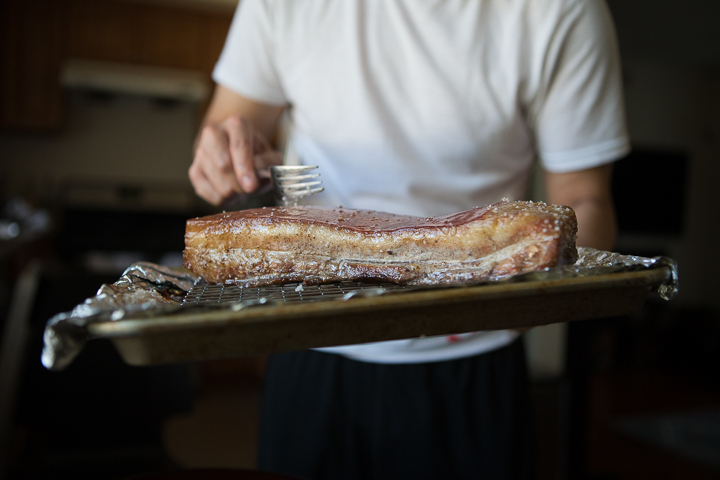 Flip the pork belly skin side up and let it dry in the refrigerator overnight (12 - 24 hours). 4. 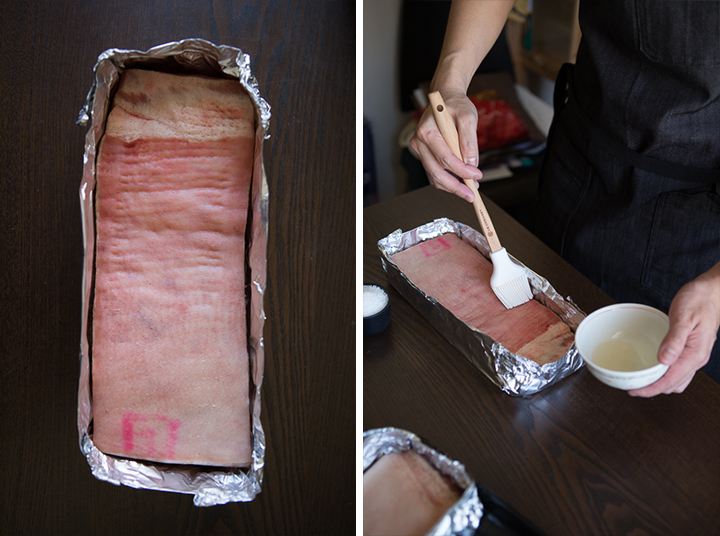 Poke holes into the pork skin. 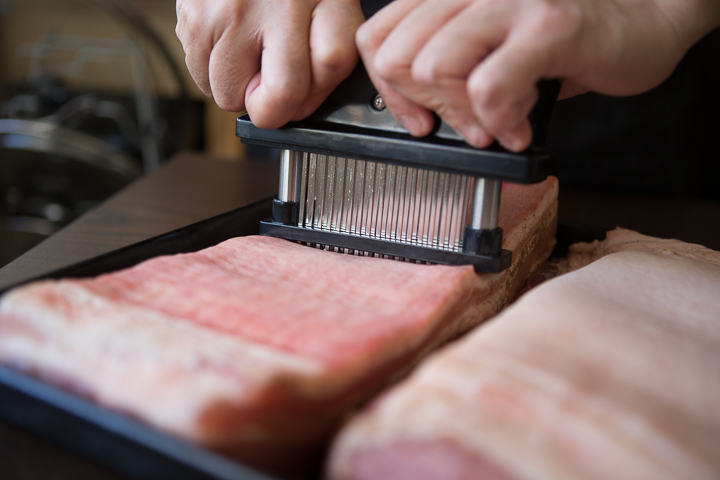 We used a tenderizer for this but you can use any tool. Generally speaking, the more small holes, the better. 5. 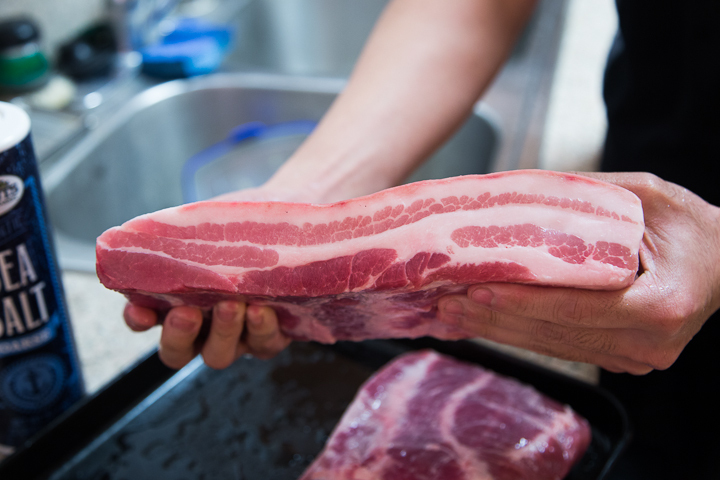 Lay out a sheet of aluminum foil and fold up the sides around the pork belly creating an inch high border around the sides. Brush rice wine vinegar over skin. 6. 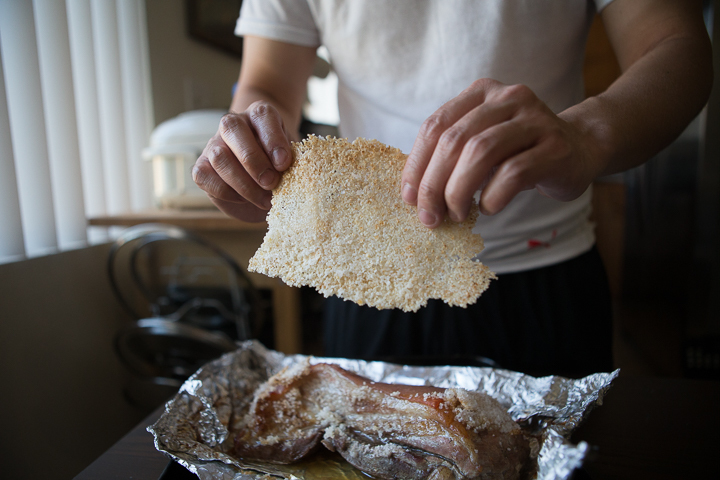 Layer coarse sea salt to cover the skin and form a a salt crust. 7. Cook for 1.5 hours at 375F. 8. 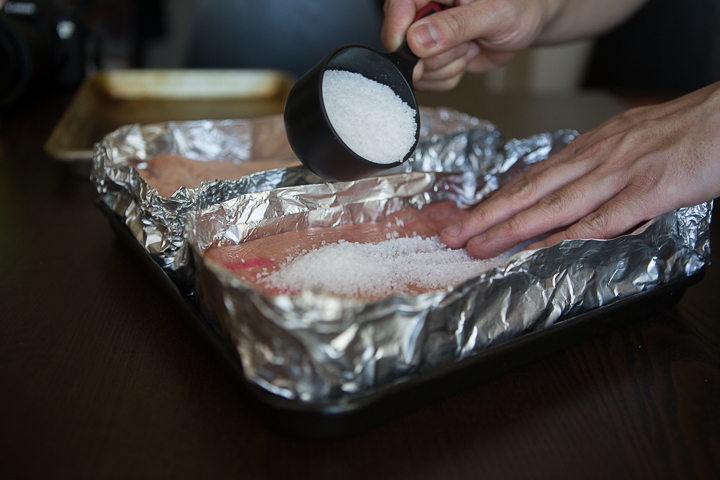 Unwrap foil and remove salt crust and any large salt pieces. 9. 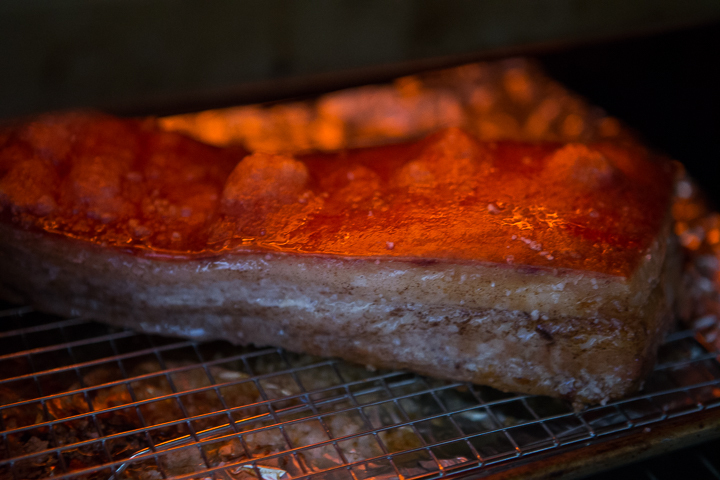 Transfer pork belly to a roasting rack. 10. 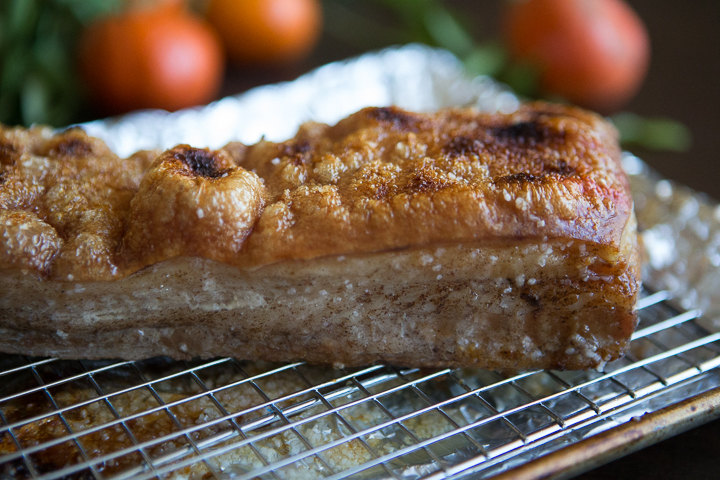 Turn on the oven broiler (low) and let broil on the lowest rack in the oven for 7-15 minutes. I would watch carefully as the temperature and distance from the broiler will vary from oven to oven and the broil time will vary greatly. 11. 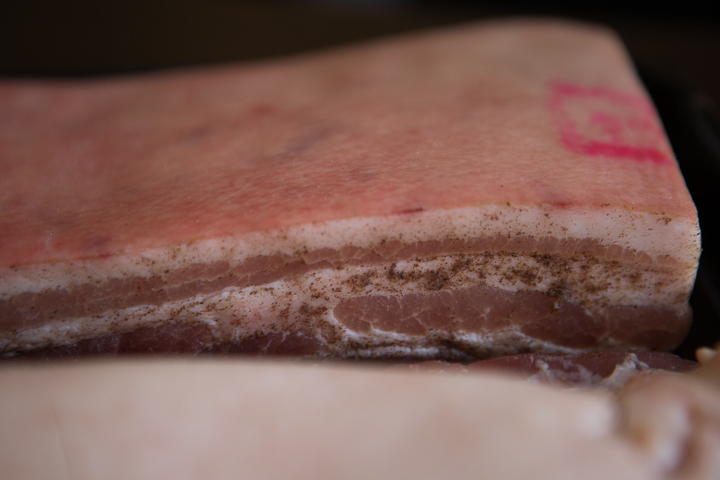 Remove once the skin has crisped and puffed up. 12. 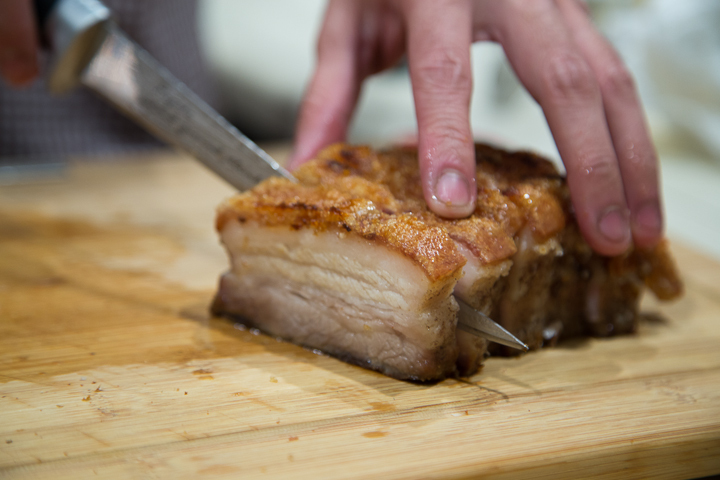 Let rest for 15 minutes prior to slicing. 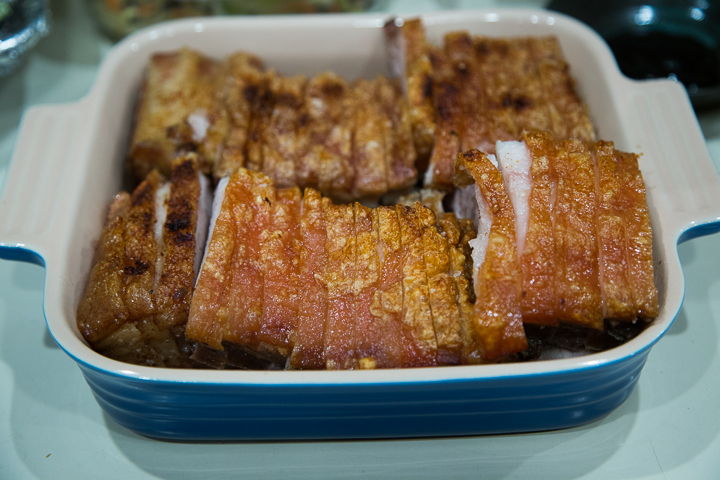 Serve with Hoisin sauce, white sugar, or our new favorite, Mang Tomas all-purpose sauce, which is usually eaten with lechon in Filipino cuisine. 1. 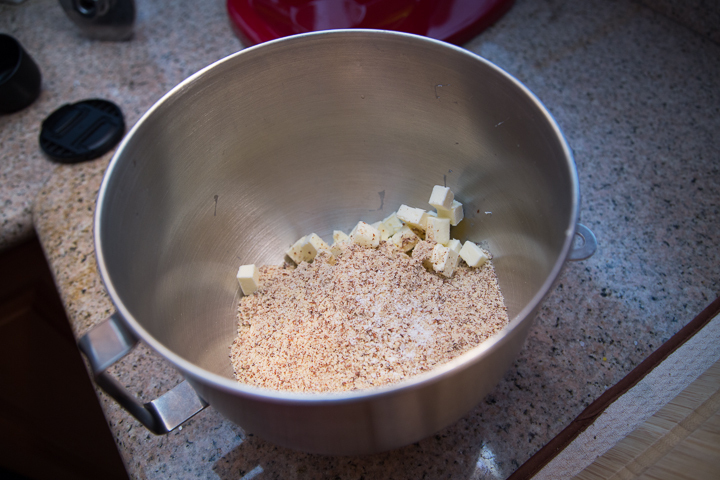 Place the almond flour, butter, and salt into the bowl of a stand mixer with the paddle attachment. 2. Beat on low speed for 3 minutes. 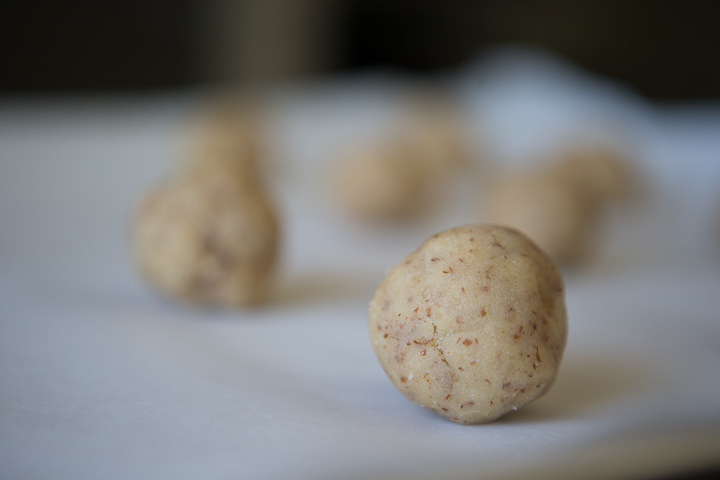 The mixture will be coarse and chunky looking. 3. 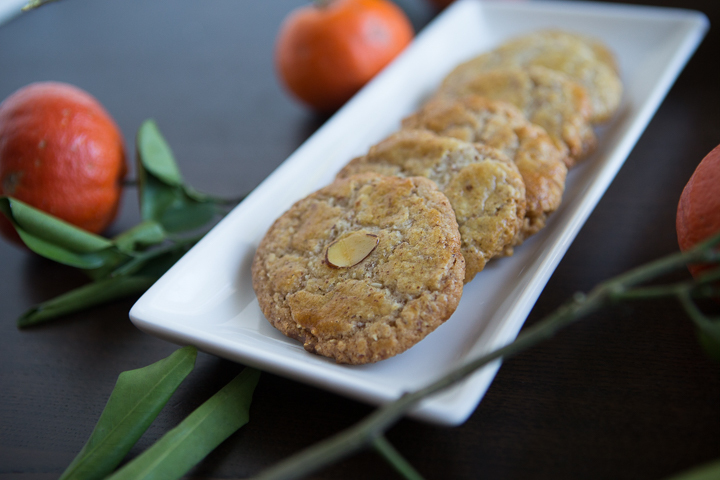 Add one of the eggs, reserving one for later, and the almond extract. Beat together until just incorporated. 4. 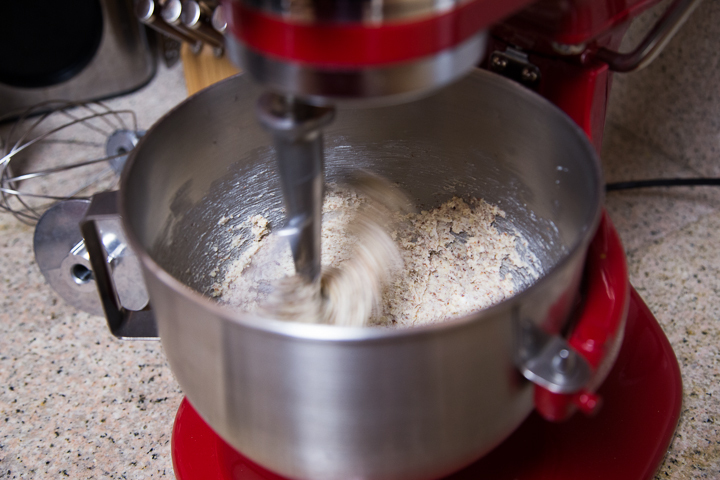 Whisk together flour, sugar, and baking soda in a medium bowl and add to the stand mixer. Mix until just combined. 5. Pour mixture out onto saran wrap and form into a disc. Wrap it up and chill in the fridge for 2 hours. 6. 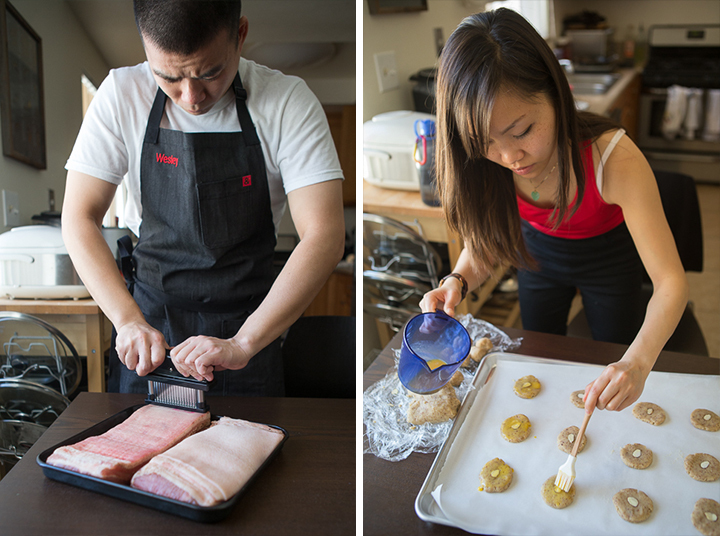 Preheat oven to 325 degrees and line baking sheets with parchment paper or silicone baking mats. Beat the egg you saved in a small bowl and have a pastry brush ready. 7. 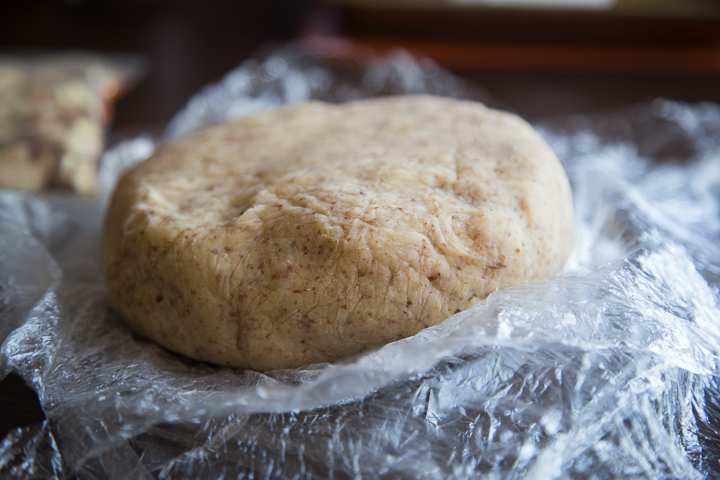 Take pieces of dough and roll them into balls, about 1 inch wide. 8. 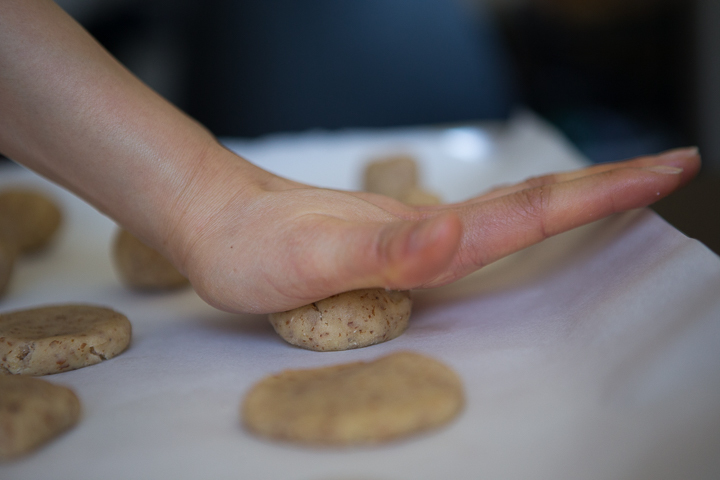 Place on the prepared baking sheet and gently press them down with your palms to flatten into coin shapes. 9. 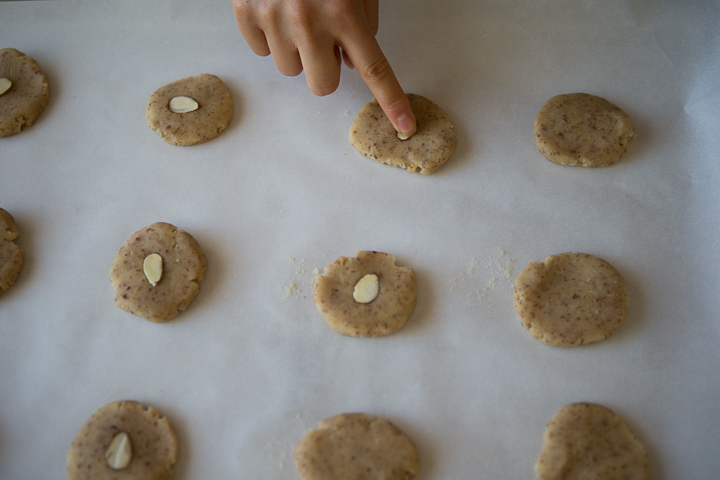 Place a sliced almond on top, pressing gently to keep it in place. 9. 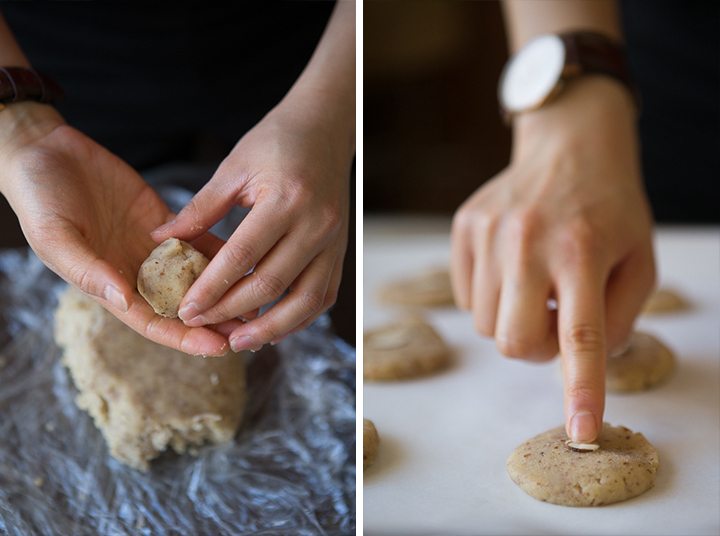 Take your pastry brush and brush the tops of the cookies generously with the egg wash.
10. 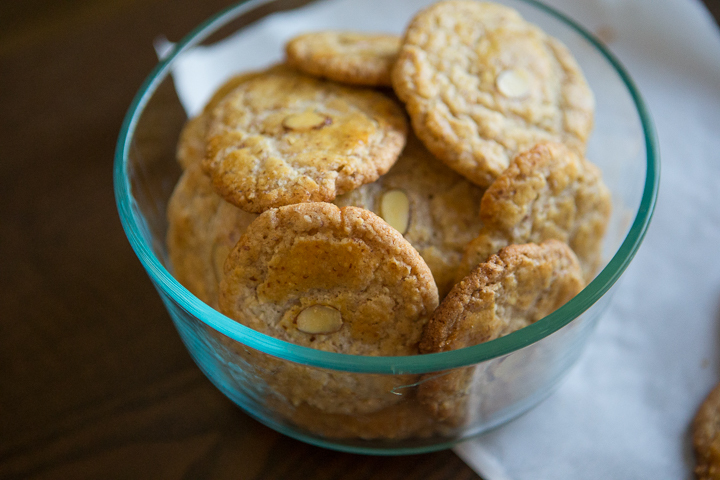 Bake for 15-17 minutes or until the cookies start to turn a dark golden color on top. 11. 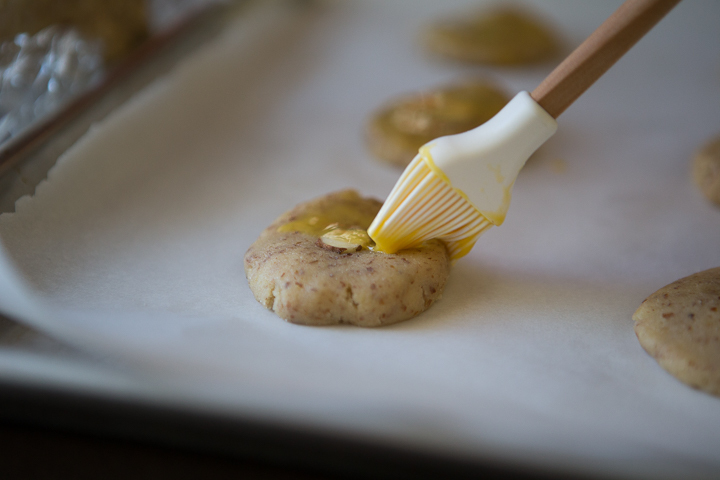 Remove and let cool on baking sheets for 5 minutes before transferring to a wire rack to cool completely. 12. Store in an airtight container for up to 2 weeks. And just for kicks, here is a throwback picture from our engagement! 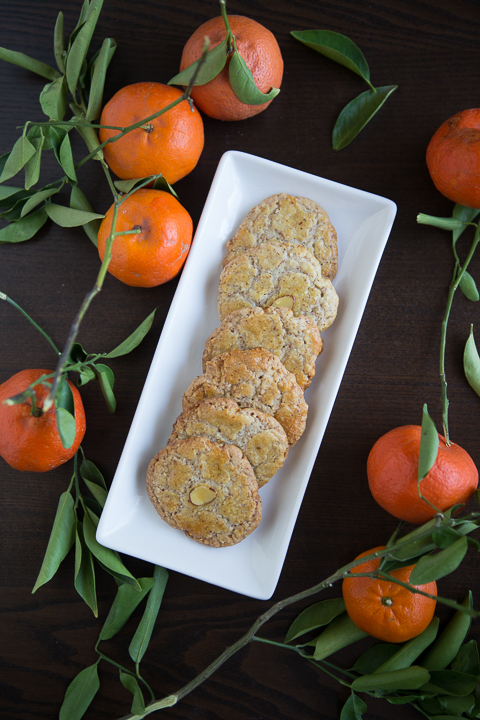 Happy Lunar New Year to all, and to all a healthy and happy Year of the Monkey!